This species is commonly distributed throughout Canada and the U.S. in the Mississippi, Great Lakes, and Hudson Bay basins. It also occurs in the Gulf of Mexico drainage area of Louisiana and Texas, and in the Red River drainage in Texas and Oklahoma. It has been introduced to some areas as glochidia on stocked fish hosts. It can tolerate a much wider range of habitats than many other unionids. 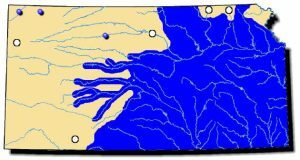 In the Apalachicola Basin (formed by Apalachicola, Chattahoochee, and Flint Rivers) of Alabama, Florida, and Georgia, this species is historically known from 59 records from 29 sites and was considered widespread throughout the system including the main channel and tributaries of the Apalachicola, Chipola, Chattahoochee, and Flint Rivers. Comments: The floater’s shell varies from tan to dark greenish-brown then to dark brown in the older shells. It has no interlocking teeth. The large umbos are centered on the shell and give the floater an inflated appearance. 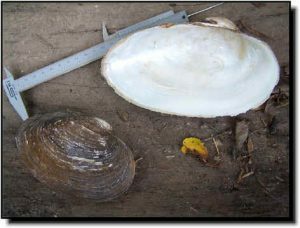 This mussel largely inhabits calm water of mud, silt or sand substrate, therefore, it is usually found in ponds, oxbows, reservoirs and slow pools of streams. Unlike most freshwater mussels that may live decades, the floater lives only about 10 years. It gets its name from the supposed ability to float in the water to move to a new location if conditions deteriorate. These mussels have been seen floating but they were already dead. Evidently, the trapped gases of decomposition cause this mussel to float. Fish Hosts: common carp, bluegill, white and black crappie, gizzard shad, golden shiner, common shiner, creek chub, white sucker, yellow bullhead, green and longear sunfish, largemouth bass and freshwater drum.